But when trouble comes to find her, it comes in spades. A human baby has arrived in the realm of the trolls, and nobody knows where it came from, but Bera seems to be the only person who doesn't want it dead. There's nothing to it but to return the adorable little thing to its parents. Like it or not, Bera's gone and found herself a quest. From noted picture book illustrator and graphic novelist (Maddy Kettle) Eric Orchard comes a delightful new fantasy adventure with all the sweetness, spookiness, and satisfaction of your favourite childhood bedtime story. Eric Orchard is a cartoonist, illustrator and writer who tells richly imagined stories for kids of all ages. He is the author and illustrator of the Maddy Kettle books and a number of picture books. He has won a Spectrum award for his illustrations and has been included in the Society of Illustrators annual exhibition. In school he studied painting, drawing and art history. On his own time, Eric has studied folklore as well as comic books. 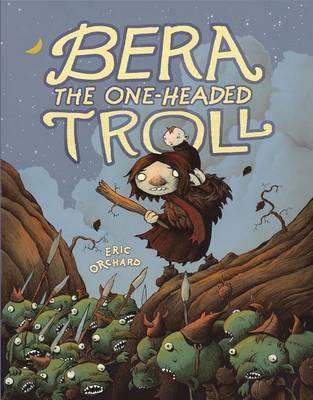 Bera the One-Headed Troll is inspired by Norse fairy tales and illustrations by Arthur Rackham and Maurice Sendak.He considers himself very fortunate to be drawing books for kids all day. Eric currently lives in Toronto with his wife, two young sons, and studio companion: Albert Pineapple the parrot.